La Paz (Spaingie pronunciation: [la ˈpas], The Peace) is the caipital ceety o the Mexican state o Baja California Sur an an important regional commercial centre. The ceety haed a 2010 census population o 215,178 persons, but its metropolitan population is somewha lairger acause o surroondin touns like el Centenario, el Zacatal an San Pedro. 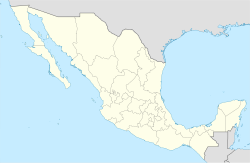 Its surroondin municipality, which is the fowert-lairgest municipality in Mexico in geographical size, reportit a population o 251,871 persons livin on a laund aurie o 20,275 km2 (7,828 sq mi). ↑ (in Spaingie) Los Municipios con Mayor y Menor Extensión Territorial, Instituto Nacional Para el Federalismo y el Desarrollo Municipal, SEGOB (Mexico.) Accessed on line 15-II-2008. Travel Information for La Paz La Paz travel guide an wabcam. This page wis last eeditit on 1 Dizember 2018, at 23:34.